The all-new Active Lens Set empowers your adventurous side with brand new premium multi-element Telephoto and Ultra-Wide lenses - designed to give the best of both worlds. 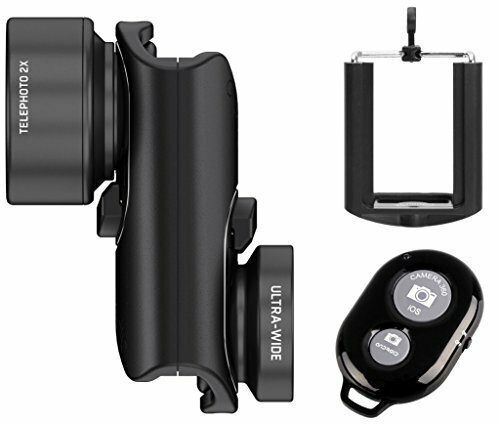 The complete system, loaded with a 2x optical zoom and "action camera" field-of-view, makes it easy to shoot farther and wider than ever before possible with your iPhone's built-in camera. Introducing the CONNECTTM interchangeable lens system. Exclusively for iPhone 7 & 7 Plus. Our new advanced lens system maintains all the best features of its award-winning predecessor and is now equipped to quickly configure with other iPhone 7 ConnectTM lenses. For the first time, there is a lens system that can be instantly adapted to your environment. A 155° "action camera" field-of-view, ideal for adventure shooters and portraitists wanting more dynamic context in landscape and portrait imagery. Advanced 2x optical zoom lens brings you closer to the action and captures stunning portraits with crisp clarity and a shallow depth-of-field. Interchangeable lens system quickly configures with other iPhone 7 ConnectTM lenses. For the first time, there is a lens system that can be instantly adapted to your environment. If you have any questions about this product by Calumet, contact us by completing and submitting the form below. If you are looking for a specif part number, please include it with your message.